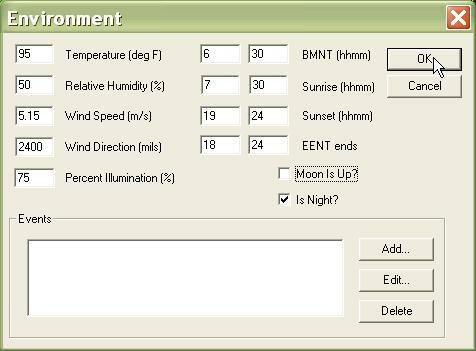 The Environment Component describes all of the conditions under which the scenario will be played, including wind speed and when the sun will go up and down. 1. To edit the environment, select 'Environment' from the 'Component' menu. 2. Input the environment data. All times are 24-hour, military times. Temperature. In degrees Fahrenheit. Affects how long smoke and chemicals remain on the ground. Relative Humidity. Also affects smoke and chemicals. Wind Speed. In meters per second. Describes how smoke moves across the map. Also effects how long chemicals remain on the ground. Wind Direction. Given in mils (0-6400, 0 is north, measured clockwise). The direction smoke moves on the ground. Percent Illumination. When the moon is up, describes how much residual visibility is available. BMNT. Before Morning Nautical Twilight. The time, before sunrise, at which the sun begins providing ambient illumination. EENT. Early Evening Nautical Twilight. The time, after sunset, at which he sun stops providing ambient illumination. Moon Is Up? During hours of darkness, whether or not to use the Percent Illumination entry. Is Night? Obsolete. No entry required.